Ivory semi-sheer sleeveless top w/sheer flounce at front & back shoulders & drawstring at neckline, w/embroidering on bottom, & ivory gouchos w/embroidering on bottom. Please use body measurement chart on beauty/hair salon page when ordering. Black & white triple layered chiffon top w/spaghetti straps, & capris w/black & white chiffon invert at side leg. 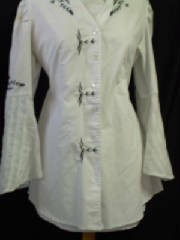 White blouse w/black embroidering. Embroidering available in all colors. 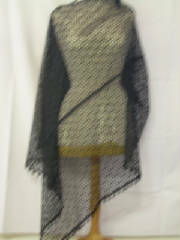 Black net poncho w/ball fringe. Black satin semi formal sheer borelo jacket w/lace, camisole w/tie that crosses over breast and ties in back, front, or side, & skirt w/ double asymmetric flounce, shorter in front & train on back. Lavender asymmetric top w/flounce. Asymmetric skirt has elastic in waist. Please use body measurement chart on the beauty/hair salon page, when ordering. Top w/floral/creme sheer/chiffon overlay w/creme underlay. Sleeves are sheer. Skirt has asymmetric floral and creme points w/elastic waist. Please see body measurement chart above before ordering. Pink & Ivory Triple Layered Top w/Ivory Pants. Top is made w/satin & sheer fabric, & pants are made w/a linen blend fabric. Black & white asymmetric top w/capris. Please use body measurement chart above before ordering. Paisly print chiffon top w/khaki capris. Capris have front splits, & side cargo pockets. Sizes differ from store bought merchandise. Please use body measurement chart above when ordering. Black asymmetric duster w/pants, trimmed w/silk at neckline & sleeves. Black fabric has an iridescent silver background.